﻿ Insider | i create angel » Chapter 02 – Trash the Dress (Live) ! 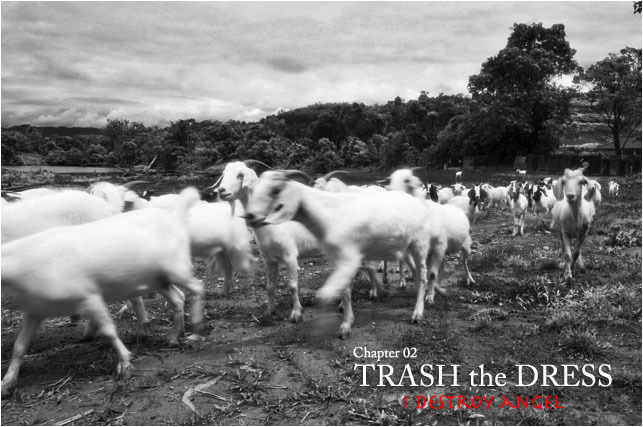 Chapter 02 – Trash the Dress (Live) ! Another destroy project has live! About 2 years ago when i heard the title ‘Trash the Dress’ conceptual pre wedding photo from western country i was get amazed, and i did shared this around my friends and client, but the feedback were crazy and strange. Yet i meet Kylie (the bride to be). I discussed with her about the topic, she was get exited and wanted to try this kind of shoot. Thanks to Kylie get ready 2 gowns for us on the section and all the way down from Ipoh, also thanks to Suki who sponsored on the make up and Behn in charged on the video. last but not least appreciate all the help from Jamal (sheep farm’s worker) for arranged all the goods. Wow!! I admire your “Trash The Dress” project!! All the photos was really unique (to me)!! thanks you guyss…!! really thank youu!! Wow…. those pictures are amazingly taken. Nice photos you have, Clive!!! i LOVED your new trash the dress series!!! Thanks for visit Toisan !